A mission of Presbyterian Women to provide warm hand knitted items at no cost to those in need. Meet mid-September to mid-June every Tuesday morning from 10 - 12. All yarn, needles, and patterns for our Mission Project are donated. 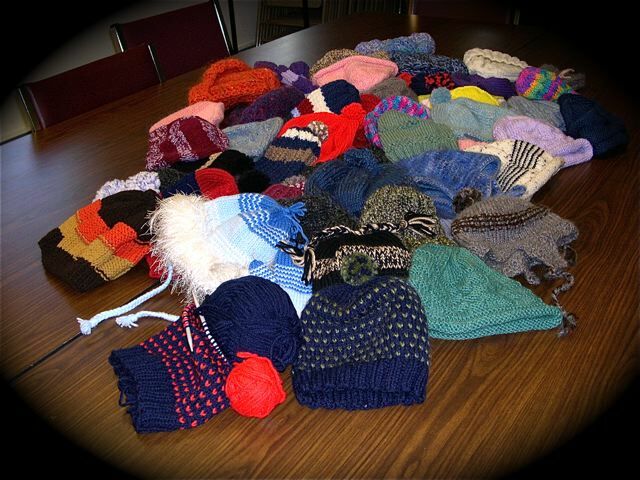 We provide knitted hats, mittens, scarfs, socks, and sweaters to those in need throughout the Kearsarge area. Our comfort shawls and lap robes give warmth and love to those who are ill or grieving. While we click away, knitting for donation and/or personal items, the group enjoys interesting conversation and sharing ideas. We welcome newcomers of all levels, along with anyone who would like to learn to knit. Our motto is: "You're never late or absent." Come join us! Happy Knitters Meet each Tuesday Morning, 10:00 til 12 noon, mid September through mid June. _On Tuesday, November 8, 2011, the Knitters sorted items and stored them on the shelves in the choir room. On Thursday, the church office called to say our cabinet arrived and was ready for use. I transferred all of the Knitters' yarn, needles, and books from the storage room to the cabinet. It will be so much easier for us to access yarn and store some of our completed items in one place. All but one of our comfort shawls, which I will be presenting to a KCPC member, and lap robes were taken to VNA Hospice. Hats and sweaters have been made available for this year's Adopt-a-Family program. In addition to our usual donations, this year I have expanded our mission to New London Hospital (Hospital Days and ABC Day Care). Currently we have 197 knitted items in our inventory for distribution. Should you know of anyone in need, please contact me. Knitters' Hands at Work! Love and Dedication in Service!